“Learn and Lunch” at Bishop’s Commons will present helpful information on how to navigate Hospice care. From left are: Karen Murray, executive director at Bishop’s Commons; Patti Chipman, from the Oswego County Hospice program; with Elena Twiss of the Friends of Oswego County Hospice. Chipman and Twiss will discuss what resources are available locally to those diagnosed with a life-limiting condition opting for comfort and palliative care services during this month’s “Learn and Lunch” event. 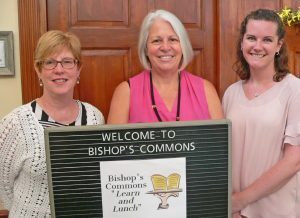 OSWEGO – Bishop’s Commons at St. Luke hosts the next in its monthly “Learn and Lunch” events on July 26 from noon to 1:30 p.m. This month Patti Chipman from Oswego County Hospice and Elena Twiss from Friends of Oswego County Hospice will discuss what resources are available locally to those diagnosed with a life-limiting condition opting for comfort and palliative care services. The “Learn and Lunch” is free of charge and open to the public. Because of the popularity of this event, those planning to attend should RSVP to Bishop’s Commons at 315-349-0799 by July 25. Bishop’s Commons is conveniently located at 4 Burkle St., easily accessible to families and visitors.